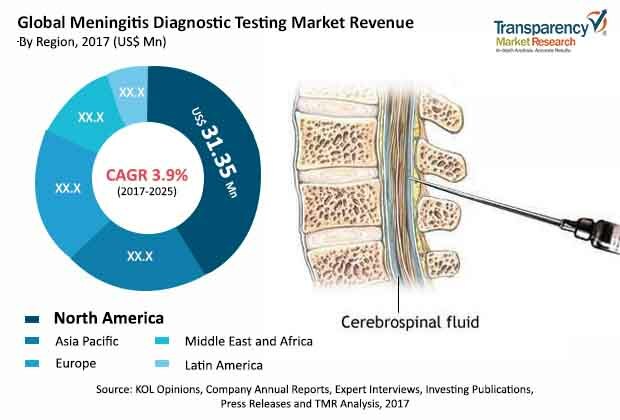 The global meningitis diagnostic testing market was valued over US$ 105.5 Mn in 2016 and is projected to register cumulative annual growth rate (CAGR) of over 3.0% from 2017 to 2025, according to a new report published by Transparency Market Research (TMR) titled “Meningitis Diagnostic Testing Market – Global Industry Analysis, Size, Share, Growth, Trends, and Forecast, 2017–2025”. The report suggests that rising demand for innovative technologies and adoption of rapid testing methods such as point of care testing is spurring the growth of meningitis diagnostic testing in coming years (2017 to 2025). The North America and Asia Pacific are projected to dominate the global meningitis diagnostic testing market in the coming years owing to due availability of rapid diagnostic tests, routine vaccination programs to prevent meningitis, and increased patient awareness. Middle East & Africa is projected to account significant market share by 2025. This is attributed to large meningitis patient base in Sub-Saharan Africa (also known as Meningitis Belt). Growing adoption of technologically advanced products manufactured by key manufacturers like IMMY, BioFire Diagnostics, etc. is likely to drive the rapid diagnostic testing across globe. The Asia Pacific meningitis diagnostic testing market is expected to witness highest CAGR of over 4.0% from 2017 to 2025. New, innovative technologies such PCR and next-generation sequencing are available in the market, providing a less expensive way for the diagnosis, prognosis, and therapy selection in patients during their treatment. This helps physicians frame appropriate therapeutic systems for patients suffering from the infectious disease. Rising demand for point-of-care services is anticipated to drive the meningitis diagnostic testing market during the forecast period. Point-of-care services provide more accurate results in less time as compared to traditional methods. Culture diagnostics has been less adopted separately, due to test limitations, lower specificity, higher time required, and the recent trend of slower adoption of culture tests compared to other reliable tests available. The report offers detailed segmentation of global meningitis diagnostic testing market based on product, and end-user. Among the product segment, PCR Assay segment is poised to account for leading share of the global market during the forecast period from 2017 to 2025. Factors attributed to the higher share of the PCR assay segment in the global market include ability of PCR to diagnose the disease within a short time period drives the PCR assay segment. Development and launch of new PCR assays with increased automation (such as BioFire FilmArray Multiplex PCR system) for the diagnosis of meningitis have boosted the segment. Also, PCR assays are estimated become more commonplace for meningitis diagnosis in the next five to 10 years. Globally, point-of-care lateral flow assay is an ideal test for meningitis diagnosis in settings with limited resources. This leads to wide adoption of these assays. This, in turn, drives the lateral flow assay segment. In terms of value, North America is likely to continue its dominance in the global meningitis diagnostic testing market throughout the forecast period, owing to early adoption of technologies, huge patient pool of viral meningitis and significant average selling prices of testing kits. Asia Pacific is projected to be the most attractive market for meningitis diagnostics testing, with highest attractiveness index. The market in the region is expected to expand at a high CAGR of over 4.0% during the forecast period due to presence of vast population base especially in China and India. Increase in prevalence of chronic diseases such as HIV & tuberculosis and surge in demand for rapid and automated diagnostics have accelerated the growth of meningitis diagnostic testing market in Asia Pacific region. The Incidence rate of meningitis is highest in Middle East & Africa however, lack of laboratory infrastructure, low disposable income, low penetration of advance diagnostic tests and poor patient awareness hinders the total share of the market. According to CDC, about 60% of total meningitis population is present in Middle East & Africa, specifically Sub-Saharan Africa (also known as Meningitis Belt). The report also provide profiles of leading players operating in global meningitis diagnostic testing market. Thermo Fisher Scientific, Inc., BioFire Diagnostics, Fast Track Diagnostics Ltd. (FTD) – Siemens Healthineers, Bio-Rad Laboratories, Inc., IMMY are major players operating in the market, offering products with proprietary technologies, such as BioFire offers proprietary products (PCR assay kits) such as FilmArray Meningitis/Encephalitis panels. Several key companies have recently introduced analytical instruments that can carry out rapid analysis in near-patient settings. IMMY (a diagnostic company based in the U.S.) CrAg LFA (Cryptococcal Antigen Lateral Flow Assay) is an immunochromatographic dipstick assay for the qualitative and semi-quantitative detection of cryptococcal antigens. This lateral flow assay has revolutionized cryptococcal antigen testing, by delivering analytical sensitivity that is about 200x more compared to other commercial assays. Other prominent players in the global meningitis diagnostic testing market include Nanosphere (Luminex Corporation), Seegene Inc., Qnostics, ELITechGroup, and Abbott Laboratories.